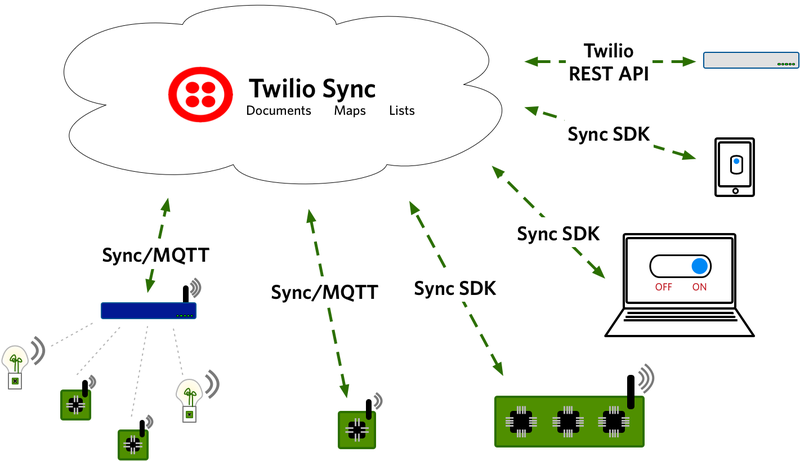 Sync for IoT makes it possible to build end-to-end experiences with your embedded and wearable devices using the same Sync primitives that connect mobile devices and web browsers. We make all this possible with new tools for your Twilio toolbox. First, we've added a Device Manager, a new tool in the Twilio Console to manage device credentials and bind hardware to Sync services. Everything in the Device Manager is also accessible in our REST API, making it easy to scale to any number of devices. Second, we've exposed Sync Objects via MQTT. MQTT is the de-facto standard protocol for low-power, low-footprint devices. Further, MQTT clients exist for virtually all platforms. Adding MQTT support extends Sync's reach beyond web and mobile - we also have a library of quickstarts for various hardware devices and programming languages. Access to Sync's MQTT support is currently by invite only. If you'd like to try what you see in these docs, sign up for the developer preview and the team at Twilio will get you onboarded as soon as possible.